It's pretty much conventional wisdom at this point that Americans have too many choices. 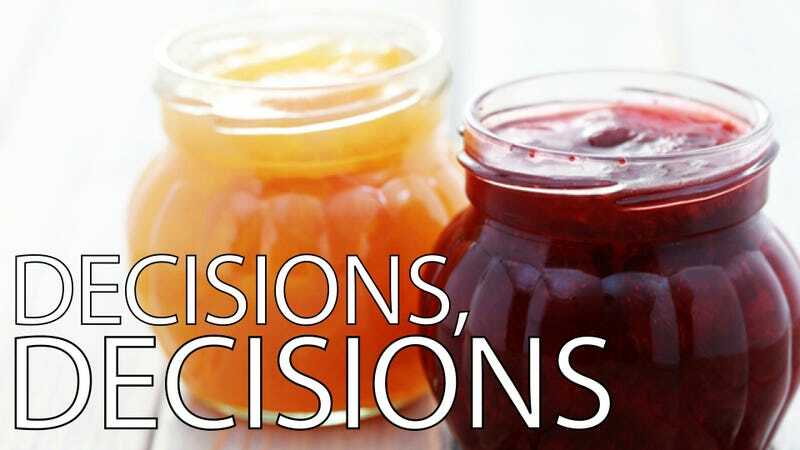 Whether it's strawberry jam or shoes on Zappos, we are just so overwhelmed with information and options that we can't think straight. This idea seems intuitively true, and is supported by certain evidence — but the rhetoric of Too Much Choice can also hurt us. [A] surfeit of information is changing the way we think, not always for the better. Maybe you consulted scores of travel websites to pick a vacation spot — only to be so overwhelmed with information that you opted for a staycation. Maybe you were this close to choosing a college, when suddenly older friends swamped your inbox with all the reasons to go somewhere else — which made you completely forget why you'd chosen the other school. Maybe you had the Date From Hell after being so inundated with information on "matches" that you chose at random. If so, then you are a victim of info-paralysis. Begley cites research showing that many of our best decisions are made unconsciously, and that too much information can crowd out the few things we really need to know. She quotes Iyengar, who says, "When we make decisions, we compare bundles of information. So a decision is harder if the amount of information you have to juggle is greater." And Iyengar's not alone. I talked to University of Texas psychologist and Psychology Today blogger Art Markman, who said, "people definitely have a lot of trouble evaluating situations when there are way too many options." He explained that people often make decisions by comparing alternatives — and when faced with, say, a "wall of blenders" at Bed, Bath & Beyond, people may feel overwhelmed by all the comparisons they have to make, and feel that no matter what they choose, they're sacrificing something better. The result: rather than relying on the shortcut of judging blenders against each other, people feel they have to become "blender experts" before they even walk into the store. Markman also noted (and Iyengar would likely agree) that it's best to have a "moderate" number of choices — not zero. And he pointed out that more choices mean more competition, which can often lower prices for consumers. It's true that many of the kinds of decisions Begley mentions — colleges, vacation spots — imply a certain degree of privilege, and the whole idea of "info-paralysis" presupposes that one has both access to information and the economic power to make choices based on it. There are still plenty of people, even in jam-glutted America, with very few choices at all. Too many product options for the middle and upper classes could, it's true, have wide-ranging economic effects — that "wall of blenders" might help fuel a culture of hyper-consumption that's bad for everybody. And if it helps people make better decisions, there's no harm at all in deconstructing the ways we choose or fail to choose. The problem comes when we use the psychology of choice as a way of limiting people's lives. In Marry Him, Lori Gottlieb referenced Schwartz's discussion of "maximizers" (people always looking for the best thing) and "satisficers" (people who find a decent choice and stick with it) as part of her argument that women should "settle for Mr. Good Enough." Those who argue that the supposed decline in female happiness is a result of feminism claim women would be better off if they let other people decide what was best for them. And then, of course, there are the reproductive choices that Congress is valiantly trying to take away. Just because people happily comply with the choices of an intimate — or, for that matter, an authority they've selected themselves — does not mean they want bureaucratic strangers making their decisions. Advocates who want to use psychology experiments to justify choice-limiting public policy should keep that lesson in mind.